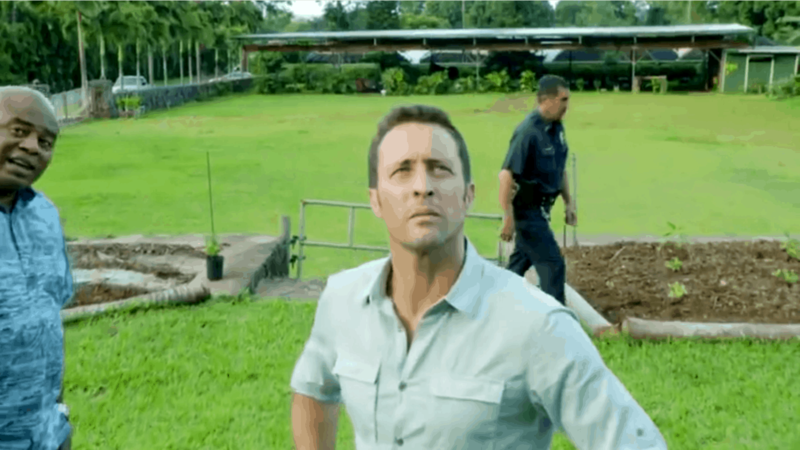 Here is the promo for the next Hawaii Five O and a few screenshots too. Looks explosive! Since it is called The New Player, it seems as if the FBI profiler, Alicia, gets more intricately involved with Steve and the chess piece serial killer plot. So much for retirement. “He Moho Hou” – When FBI Profiler Alicia Brown (Claire Forlani) finds a body in her bed, she is forced to join McGarrett in the hunt for the chess-piece killer. Also, Kono reconnects with a former surfing competitor (Kanya Sesser), who is now a disabled and homeless war vet, on HAWAII FIVE-0, Friday, Oct. 7 (9:00-10:00 PM, ET/PT), on the CBS Television Network. Elizabeth Röhm also guest stars as a police psychiatrist, Dr. Madison Gray. Looking forward to the next move.